The Dutch hang flags on high days and holidays. Paul ordered flags and flagpoles (of course he would, he's interested in heraldry and stuff like that) so today is definitely a good excuse to use them for the first time. 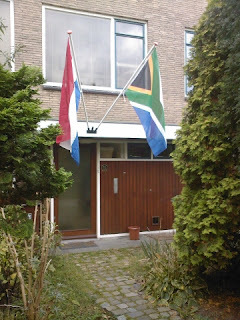 Of course it's bad manners to hang just the South African flag here. That's why the Dutch one is out too.